The Boston Red Sox have put up an American League East championship banner, but it's not the same one three men say they found on a suburban highway earlier this week. That one is now in storage at the center of a police investigation. The new banner was put up Friday outside Fenway Park after the team's title-clinching 11-6 victory over the New York Yankees on Thursday. 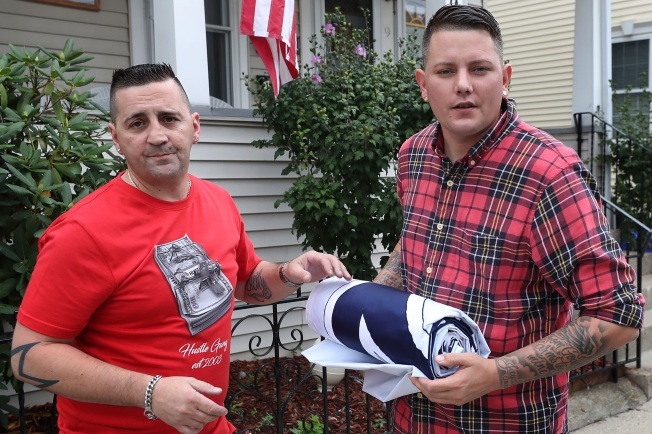 Louie Iacuzzi, James Amaral and a friend said they found the original banner on a Somerville highway on Monday. The Red Sox said then it appeared to have fallen off a delivery truck. But the owner of the company that made both banners, Tony Lafuente, says the original banner may have been stolen, so he contacted police. Iacuzzi and Amaral deny stealing the banner. The Red Sox issued a statement about the matter on Friday. "The original banner is being stored," Red Sox spokesman Zineb Curran said. "We preferred to hang the one that was in our possession the entire time." The Red Sox added that there is "nothing to add" regarding any police investigation.